Joe Ciaburri was born in New Haven in the Hill Section ad­jacent to St. Anthony’s Church. At the age of 15, he started his banking career at the Community Bank and Trust Com­pany, New Haven’s Italian bank, as a messenger. That was the start of a remarkable banking career of over 60 years in which he was the founder of two New Haven commercial banks, the Bank of New Haven and the Bank of Southern Connecticut and was the Chairman, Chief Executive Officer of six community banks, besides the two he founded. He has been honored by the State of Israel, the United States Small Business Administration, and served on the Economic Advisory Council of the Department of Commerce during Ronald Reagan’s administration. He has gotten four major awards at Southern Connecticut State University including the Presidential Medal, the University of Notre Dame and Providence College. 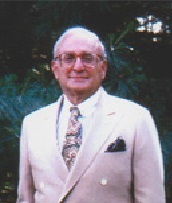 As past president of the Amity Club and the New Haven Symphony, Ciaburri numbers amongst his 26 awards, awards from civic, banking, arts, education, charitable and sports awards, including the American Committee on Italian Immigration ACIM Award. Among his greatest accomplishments he feels that the 3 year Chairmanship of Columbus Day activities and a telethon on Channel 8 for the Italian Earthquake Relief Fund in 1984 which raised $495,000 for ravaged Italy. Joe and his wife Mary Grace have three children and are residents of Branford. They spend six months in Palm Beach, FL.